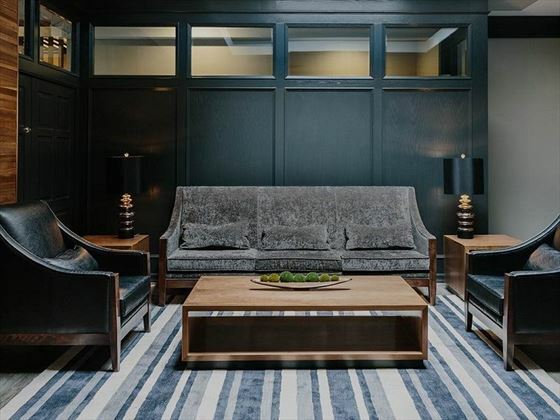 Cool, contemporary, trendy…formally the Banff International Hotel, Elk + Avenue Hotel has been given a chic makeover. 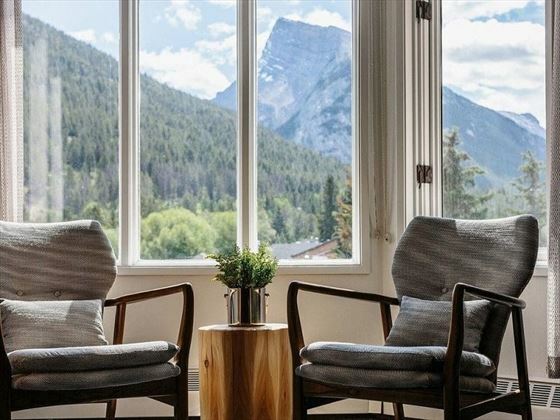 With downtown Banff just outside your doorstep, this gorgeous hotel offers a modern take on the classic cosy ski cabins well-loved by those travelling to Banff’s epic mountaintops. 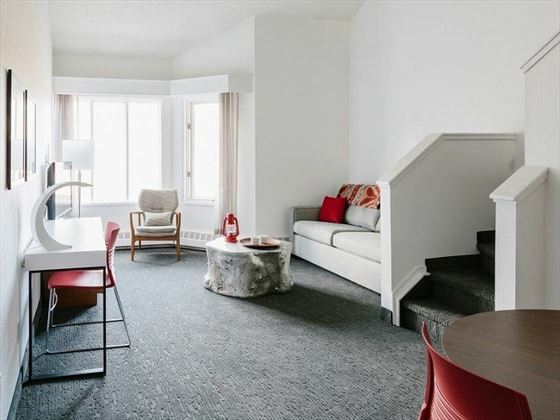 The dark leathers, rustic woods and charming interior touches – including contemporary artwork, faux fur cushions and tree trunk coffee tables – make this a stylish stay amongst downtown Banff’s cool nightlife, shops and restaurants. 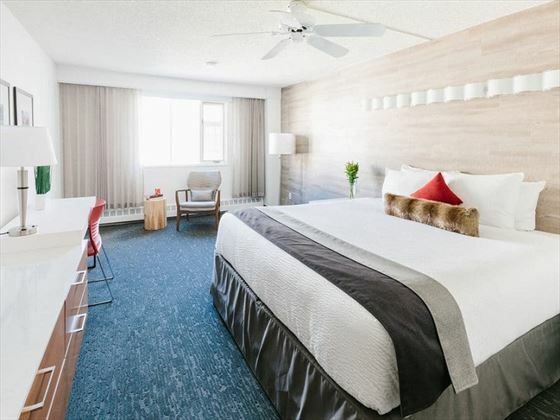 The rooms and suites have a minimalist vibe, with lovely views and comfy amenities. We love the Loft Rooms – they add a quirky touch with their lofty location and modern look. 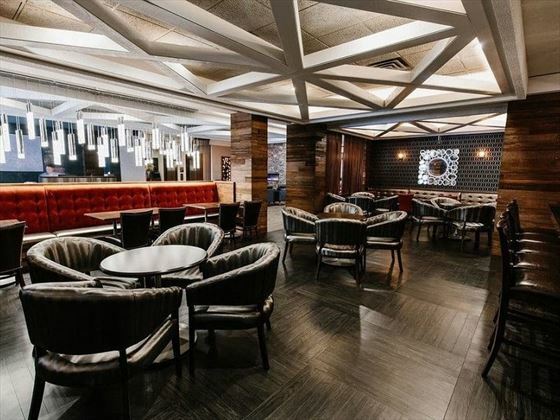 The sleek designs carry on into the cool RG’s Lounge, a laidback bar space with fantastic late-night snacks and even better drinks, whilst Ricky’s All Day Grill is a truly sumptuous treat. Choose between seven kinds of eggs benedict for breakfast, and then tuck into a deliciously sticky plate of BBQ Ribs for dinner. In between feasting on American classics, Banff’s exquisite array of shops – and even the amazing Banff Gondola - are only steps away. 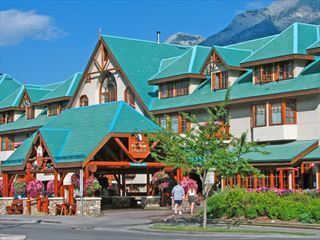 The hotel is located in downtown Banff, just a few steps from the charming streets full of restaurants, shops and nightlife. 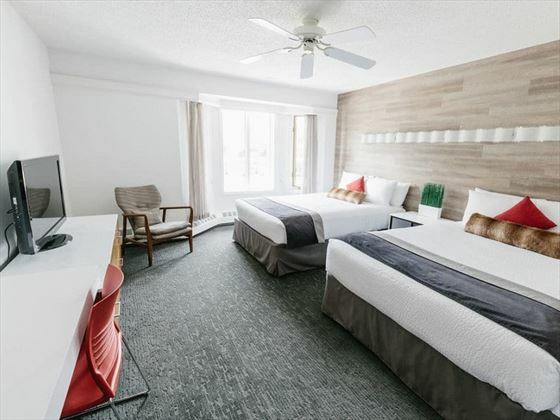 Two Queens – Minimalist rooms with two queen beds, and the standard amenities. Sleeps a maximum of four guests. Regular King – Similar to before, this time with a large king size bed. Sleeps a maximum of two guests. Loft Room – Quirky rooms nestled up in the loft, featuring a large sitting room, an upper loft area with two queen beds, and many have gorgeous mountain views. The tree trunk coffee table and grey hues add contemporary-rustic charm. Sleeps a maximum of four guests. 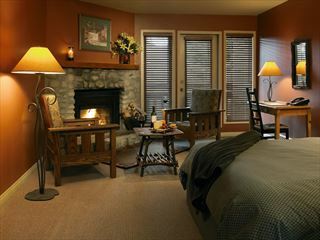 Deluxe Two Queens – Much larger rooms, featuring two queen beds, pretty mountain views, a deluxe ensuite bathroom, and a small sitting area with a tree trunk coffee table and two chairs. Sleeps a maximum of four guests. Deluxe King – Spacious rooms with large windows looking out onto the soaring mountains, plus a small seating area with a sofa and chair. Sleeps a maximum of two guests. 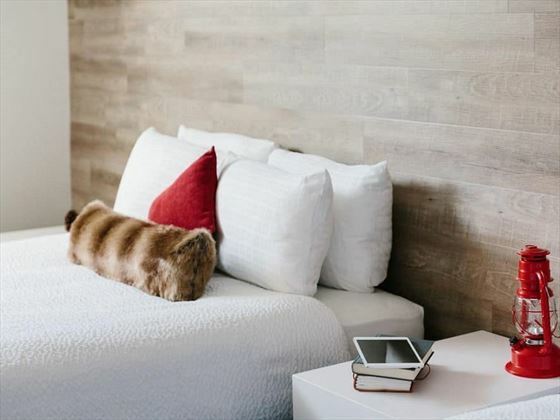 Junior Suite – Contemporary suites featuring a separate living area and a private sleeping space with two queen size beds. The mountain views are gorgeous, and the minimalist décor adds a modern touch. Sleeps a maximum of four guests. 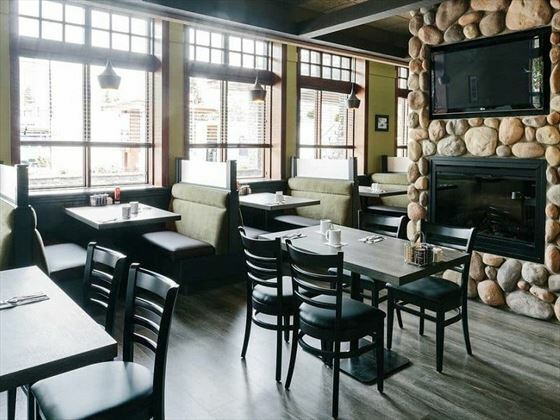 Ricky’s All Day Grill – This welcoming and friendly restaurant is known for its epic breakfasts, including seven kinds of Eggs Benedict, sumptuous breakfast bowls, and decadent French toast. The lunch and dinner menus have true-American vibes, with hearty burgers, huge salads and sticky BBQ ribs all served with a big smile and a laidback come-as-you-are ambience. 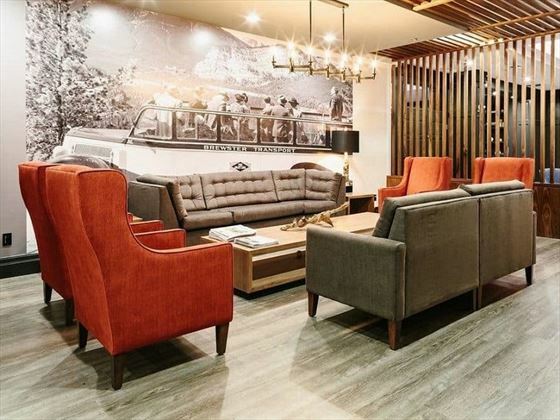 RG’s Lounge – Nestled in the hotel’s lobby, this chic lounge and bar evokes a chilled vibe with its fireplace and plasma TV’s, offering a fantastic spot to unwind and hang out whilst tucking into late night snacks and sipping on fine wines and tasty cocktails. 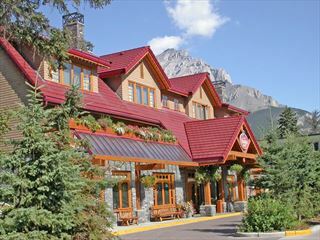 Explore Rockies Activity Centre – a modern store offering a brilliant selection of Canadian art, clothes and gifts. This is also a lovely spot to sit in a cosy sofa chair on the patio and marvel at the stunning Rockies. 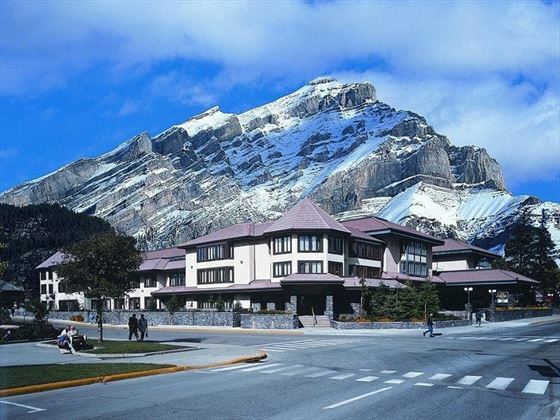 The hotel is only minutes away from Banff’s spectacular hiking and biking trails.